Fizz and I have been having a tough time of it the last couple of days, “Buzzard Luck,” we say, that’s what you call it when you have no luck at all. A storm blew in and getting out has been a trial, you can forget photographs. It is worse for her, she is small. We can wait indoors till the rain stops but the wind is relentless and spoils everything. I am going to have a little drink tonight. I think that I made up my mind on Wednesday that I would have a drink on Saturday and so I was looking forward to it. You understand looking forward to something don’t you? Imagine my disappointment when this happened! So I took Fizz out in the horrible weather because 1) Dogs need walking and 2) Sheep need checking and I didn’t want to do them on my own. There was one missing. I counted them over and over because it is difficult to count sheep but I couldn’t get more than 35 and there should be 36. So we searched the hedges. 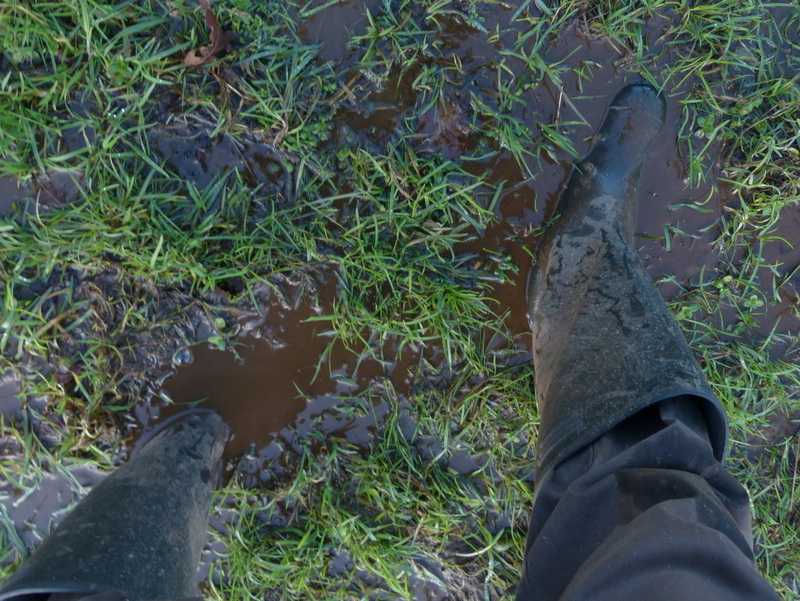 Four fields, 60 acres in total, it is a lot of hedge, on foot. The whiskey shop closes early in the village and time was ticking by. 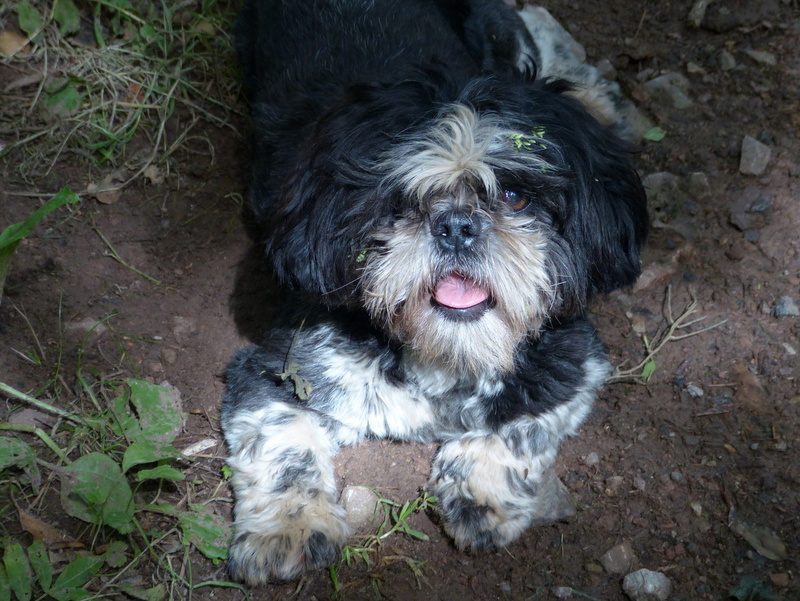 There is nothing that I can do about it, there is an animal missing and I can’t find it. I went back to the farm. At the farm I met a friend of mine, the same age as me but he has worked on farms all of his life. He renovates old tractors in our farmyard now. He is the best man for Sheep problems. We found it. I had counted right and the lost lamb was caught up right by the gate of the first field that we looked in. Stupid, stupid Sheep. You had me so worried. It didn’t take any time to find it and I made it to the whiskey store in time and so I am enjoying a little drink with my coffee as I write this. Just as we were about to land by the top field, my friend brought his Thunderbird to a halt and wound down his window. “You haven’t got your camera on you, have you?” he said. Then ignoring Parker’s urgent enquiries into the progress of the mission he put the Thunderbird into reverse and pulled up here. These pictures won’t win any prizes, it was a dark overcast day and my camera is at arms length stretching over the driver to try and see out of the futuristic rescue vehicle’s window but it is good for me. I have been trying to get close to this bird since I arrived here. The stupid animal only really had one pose but if you study my pictures carefully the head moves. “Do tricks” I shouted but she wasn’t having it. 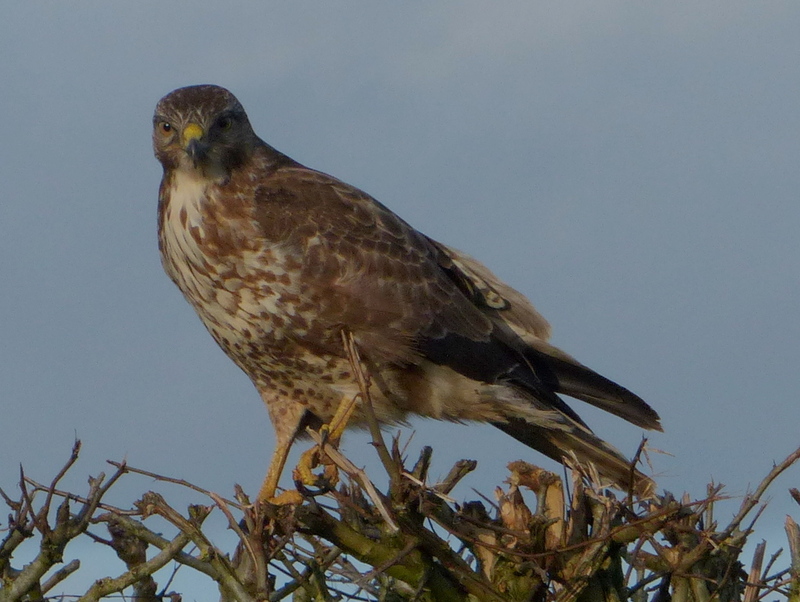 It is a Buzzard, they are very common here but they circle high above me. I have to describe their cry as plaintive, it is lonely and distant but also beautiful. They are always here, sometimes flying in clear blue sky, brilliantly illuminated by the sun and sometimes swooping out of the darkest cloud in the first light of morning. This is something that I believe, “If you be nice then nice things will happen to you,” that is what it felt like. Dog walked, Sheep saved, beautiful wildlife observed. If you are lucky enough to have Smellyvision then this would also be a good time to scratch your screen. 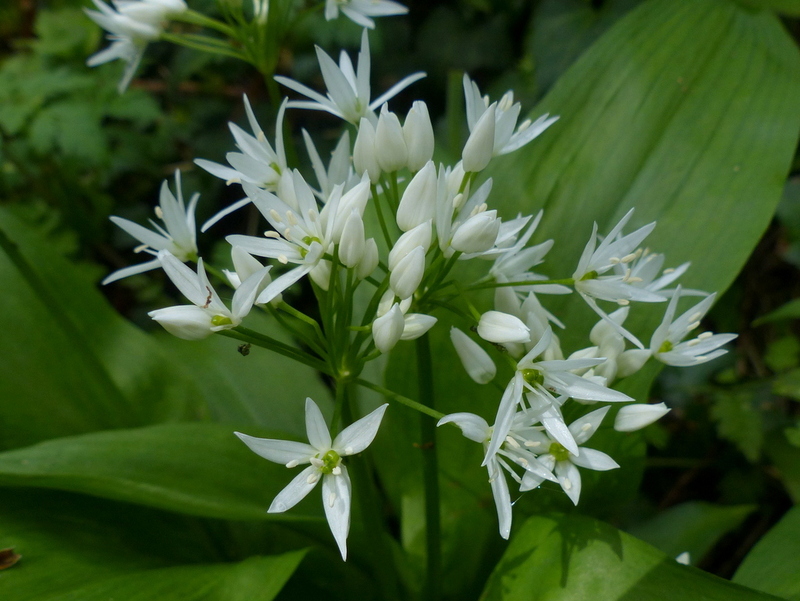 It is a beautiful native wildflower and a heady scent of garlic in the woods, it is also very good food. The first leaves appear late in February. 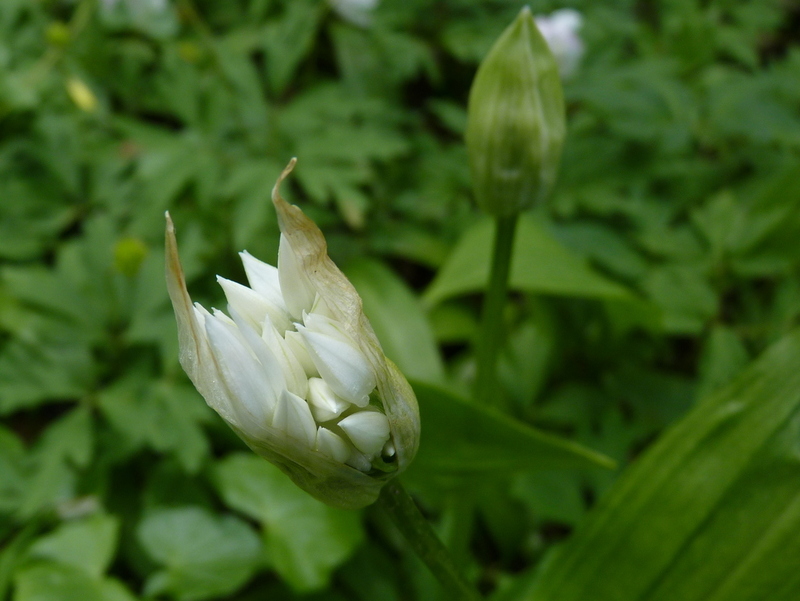 The leaves are best harvested in March and April before the flowers appear. I have heard that you can boil them but I don’t know why you would do that, they are an excellent addition to salad when served fresh and uncooked. 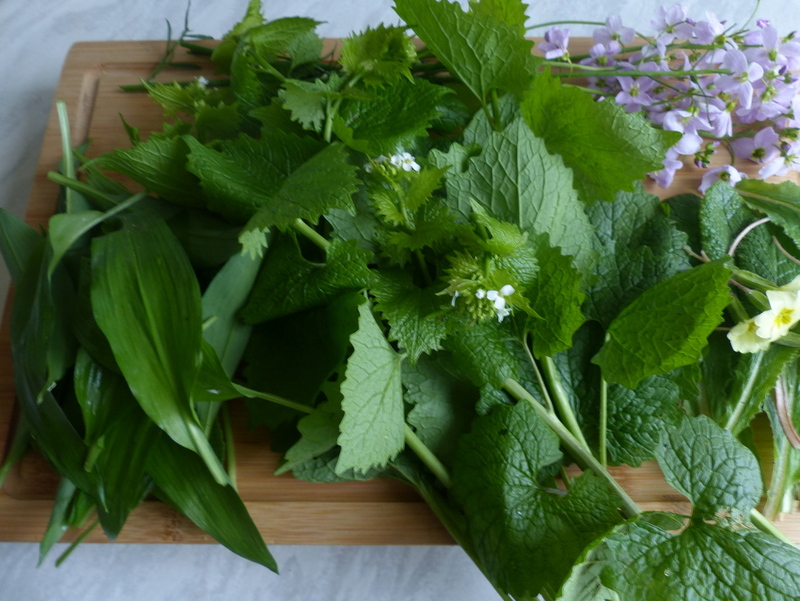 On my plate I have Wild Garlic, Garlic Mustard, Cuckooflower and primrose. 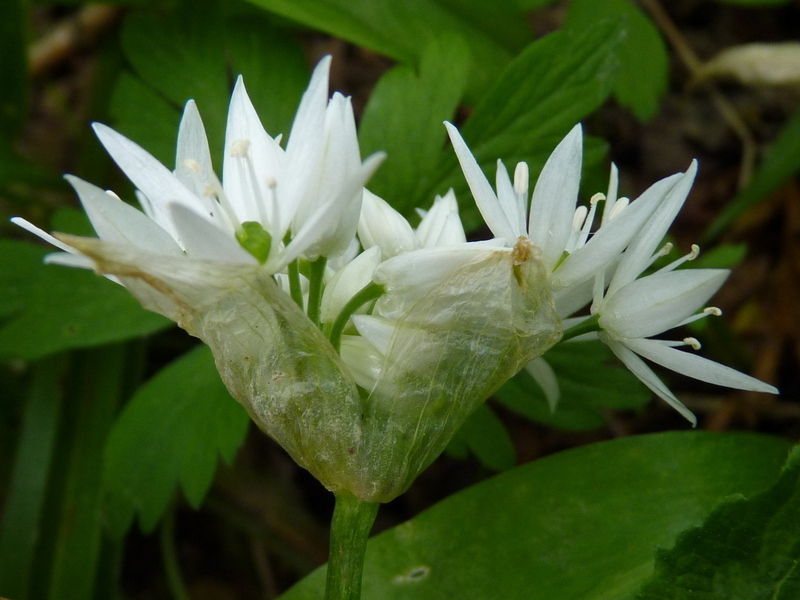 Some care must be taken when collecting Wild Garlic. 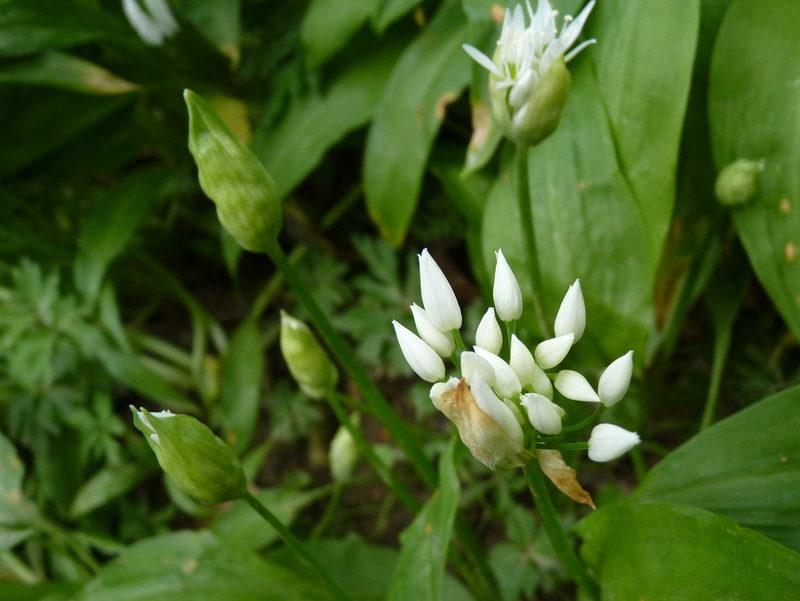 The leaves are easy to identify, they grow on single green stalks, they are quite large and lance shaped with smooth edges and most importantly, they smell of Garlic. 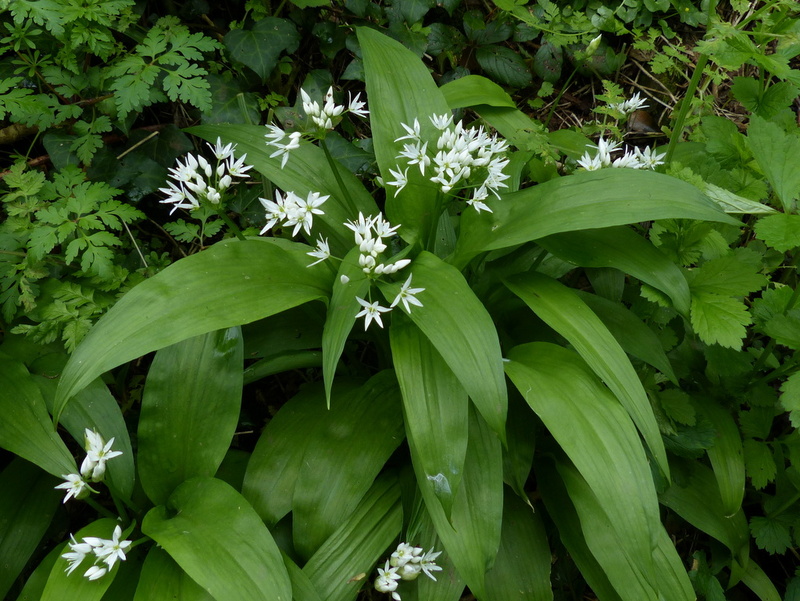 Every year there are cases of poisonings concerning Wild Garlic, more so in Europe than the UK because foraging is more popular there. 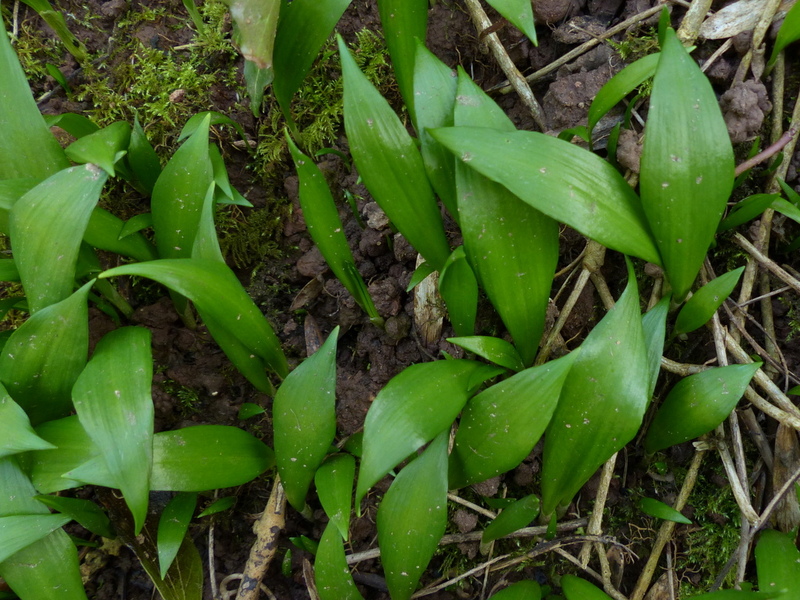 Poisonings occur because Wild Garlic grows in large patches and there will be other things growing in amongst it. 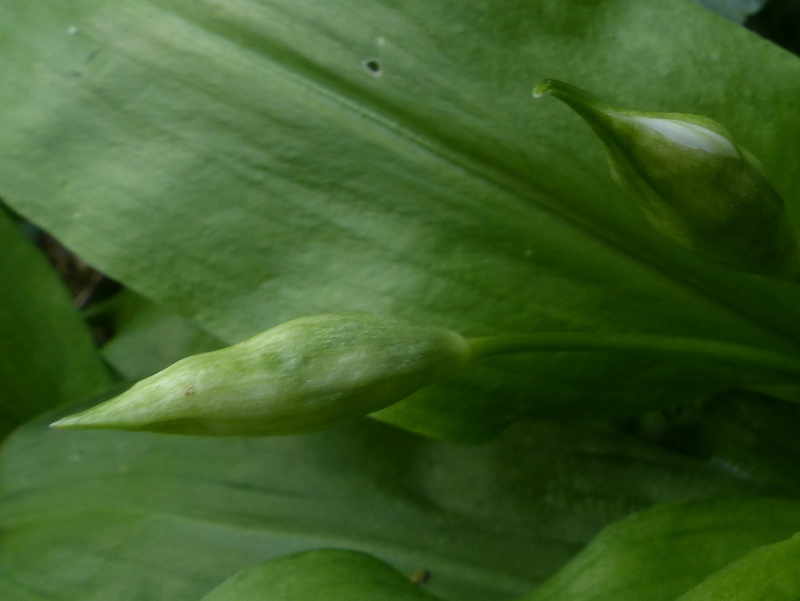 In the next two pictures there is Wild Arum and then Dog’s Mercury growing amongst Wild Garlic, both potentially fatal. It is tempting to gather up this delicious herb by the handful but personally I select and check each leaf individually as I collect them. It is important to know what you are eating. The flowers start to arrive in April. 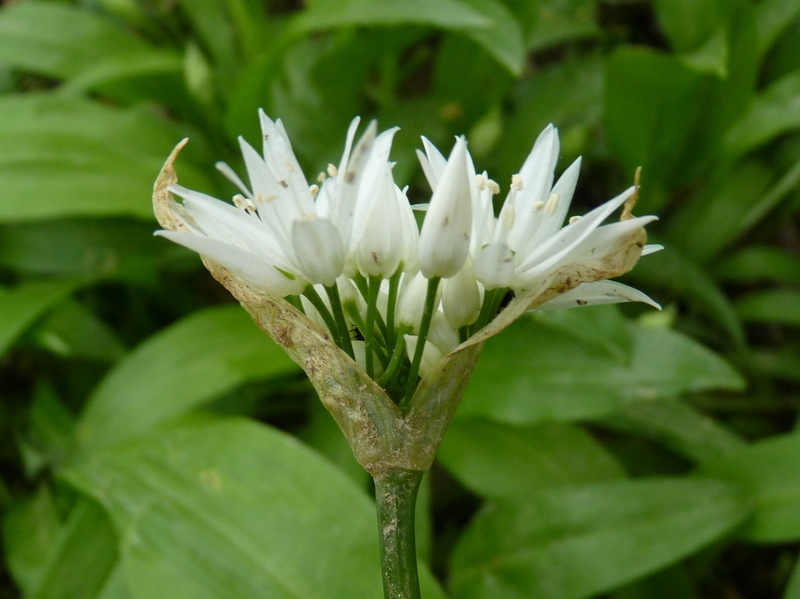 The flowers can now be eaten and added to salads in the same way as the leaves, they have a slightly stronger garlic flavour. At first they look like large uneven green buds. These are actually a pair of green bracts that are forming a case around an umbel that might carry as many as twenty flowers. The bracts turn papery and fall off as the umbel expands. This is what was in each of those green cases. 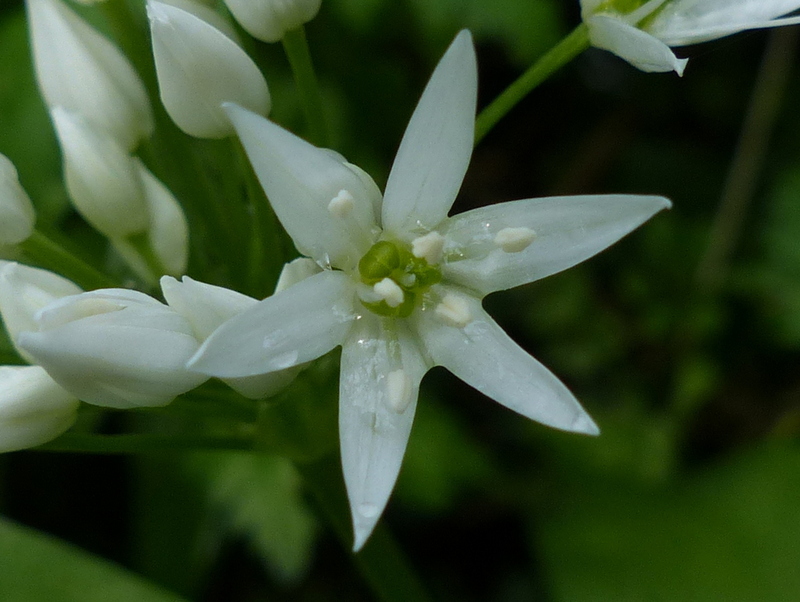 Each flower on the umbel is composed of six white petals, it has six stamens and the pollen is pure white, there is a single style in the centre and at the base of that is the green, three lobed ovary. The seeds are edible and so the flowers can still be gathered as the seed starts to ripen. 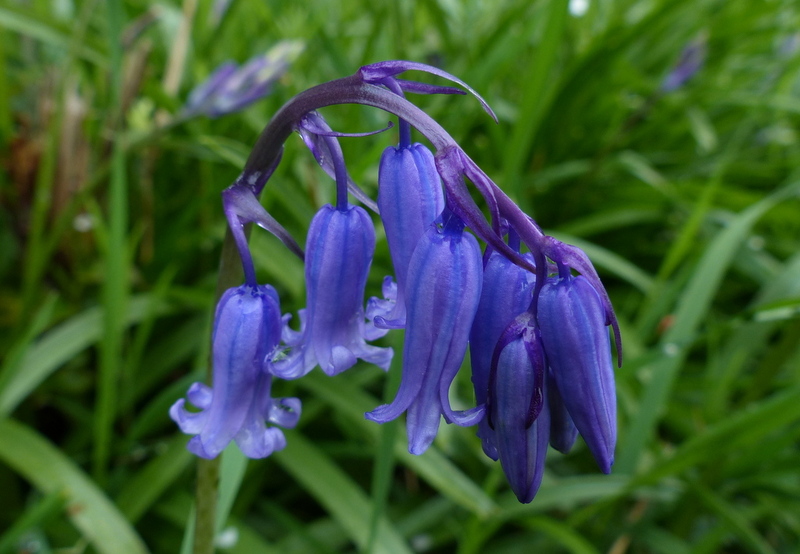 The bulbs are also edible but taking them removes the whole plant from the wild, they are small and best left in place to provide for future crops. 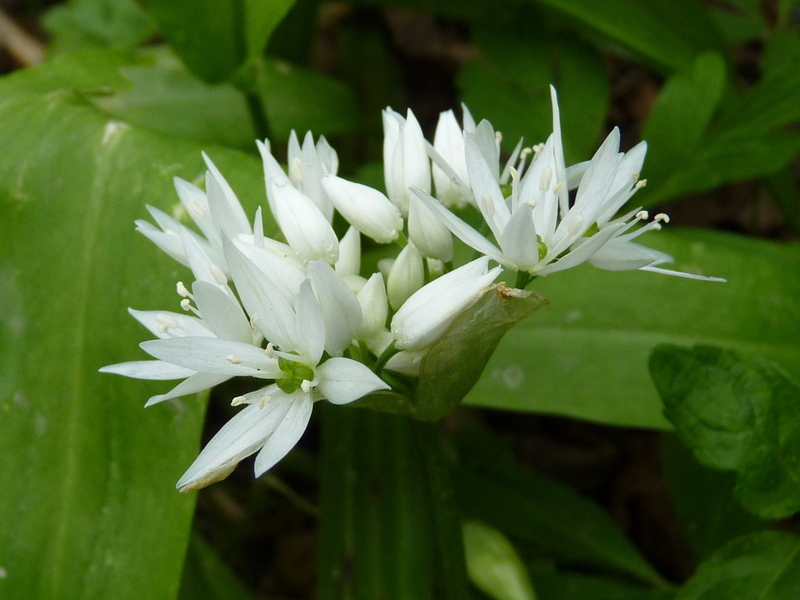 Wild Garlic is hermaphrodite and it is self fertile but is also pollinated by insects. It produces a lot of seed and spreads easily. 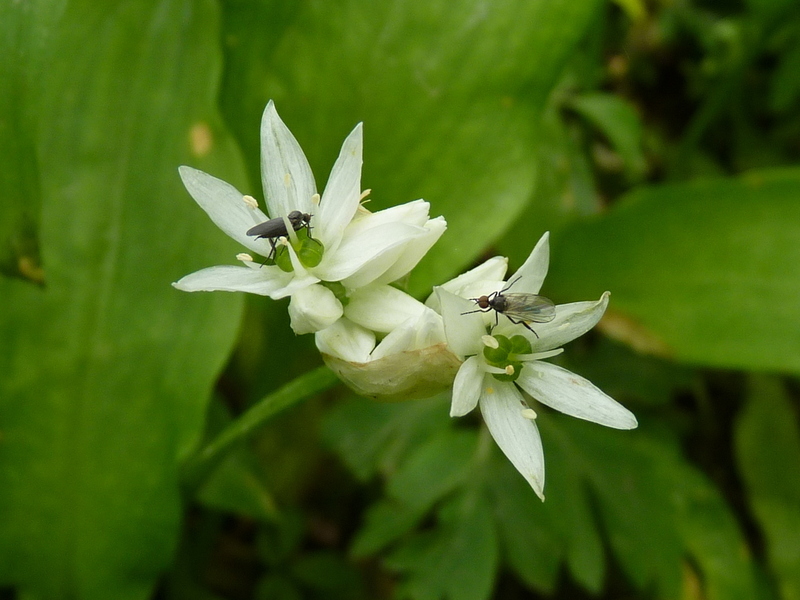 It also produces little bulbs on the base of the original bulb and can be propagated by division. Do you think it’s coincidence that the garlic often grows with toxic plants, or possibly a self-defense plan? Your opening story is too cool. Niceness, stupid sheep, boring poses, whiskey, and victory rolls! Use great care, indeed! Wouldn’t want to accidentally help the individual I was trying to poison. Close-ups of birds and flowers. Great post, made me happy. 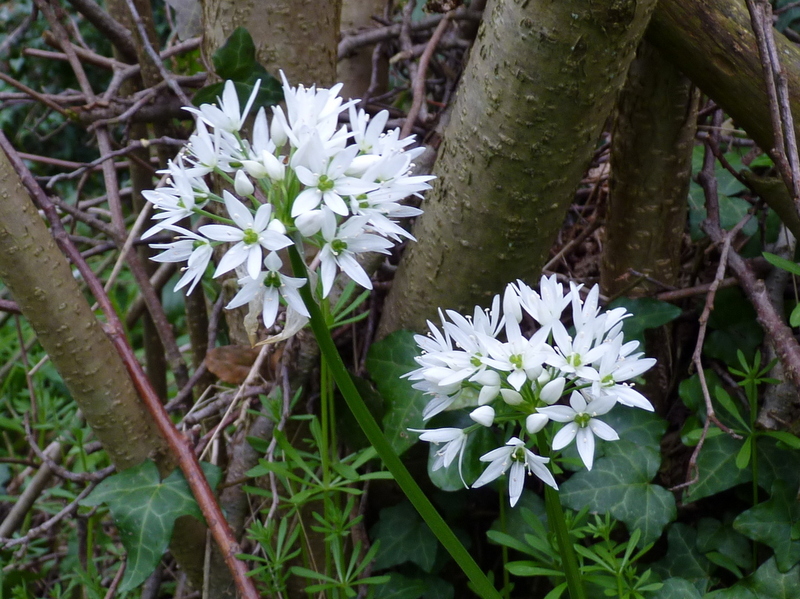 I love to walk through deciduous woodland and breath in the garlic. 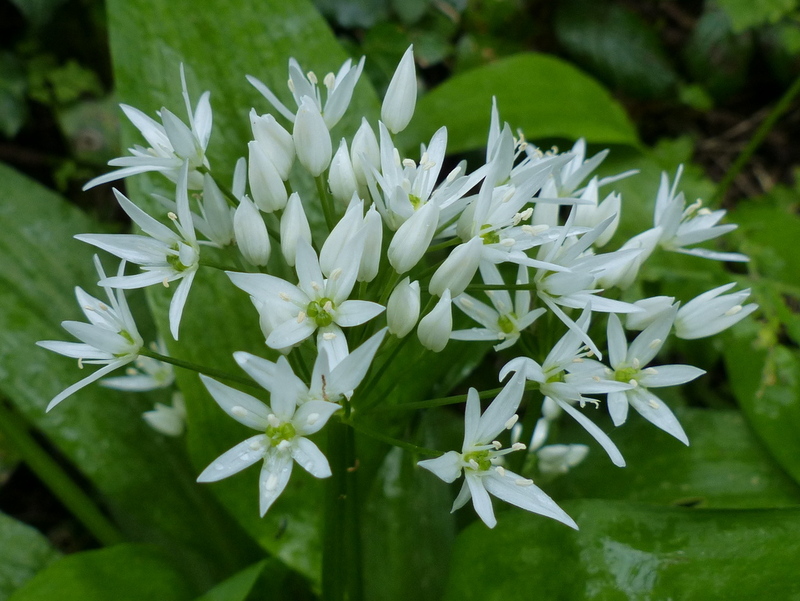 Some of the roads where we used to live would have such a powerful wild garlic smell you could even get the whiff whilst driving. Thank you Stephen 🙂 Woods are wonderful places for holding the scent. 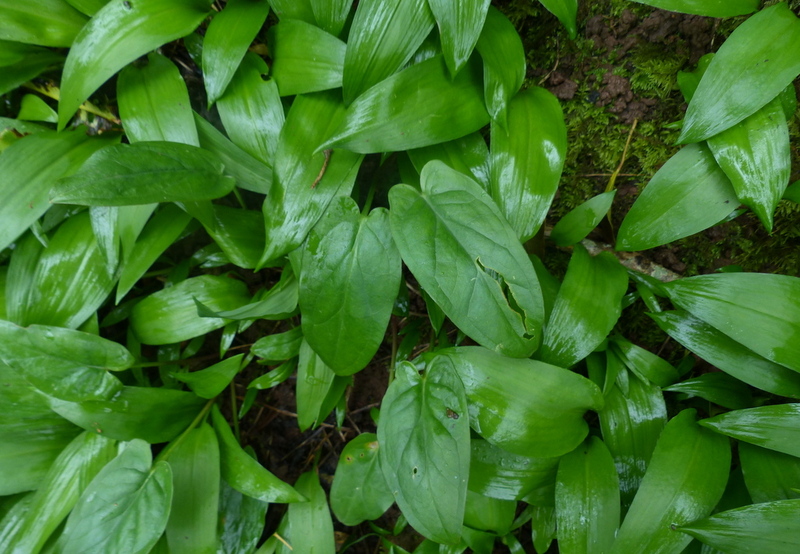 I want a buzzard and I love the wild garlic. 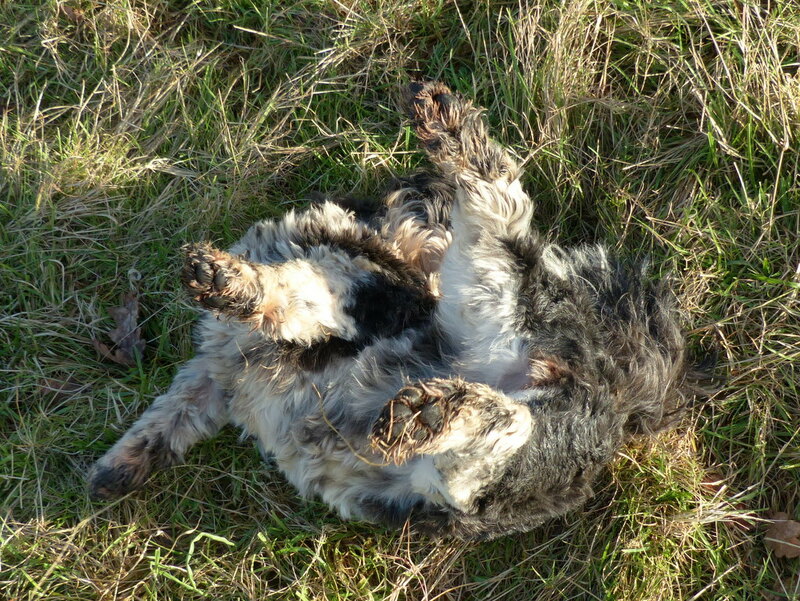 You can keep Fizz, I think she’d be happier where you are. Thank you Virginia 🙂 Buzzards are wonderful but it is very rare for me to get close to them. Thank you so much Becky 🙂 A lovely thought..
Lovely post ! I’m glad you rescued the silly sheep and managed to get to the whiskey shop too. 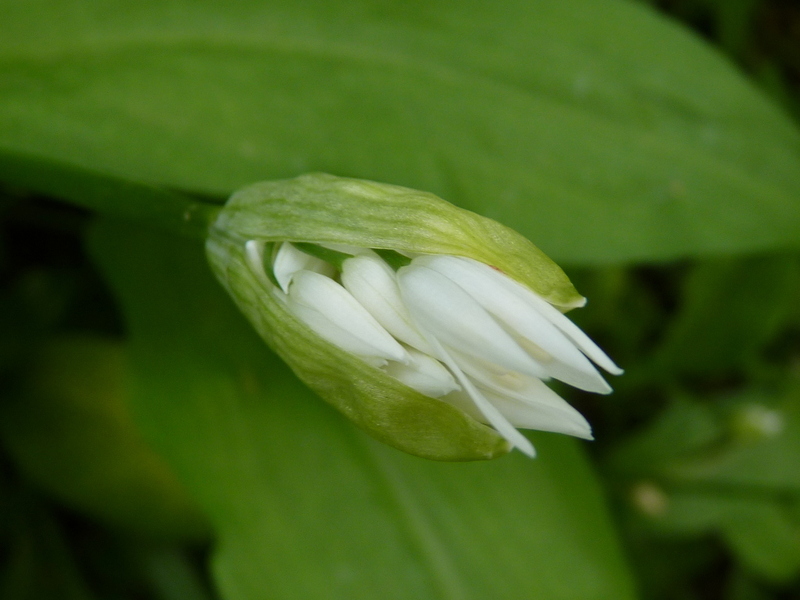 My husband bought me a single Ramsons bulb last year and I have planted it at the side of one of our ditches. I hope it has survived. 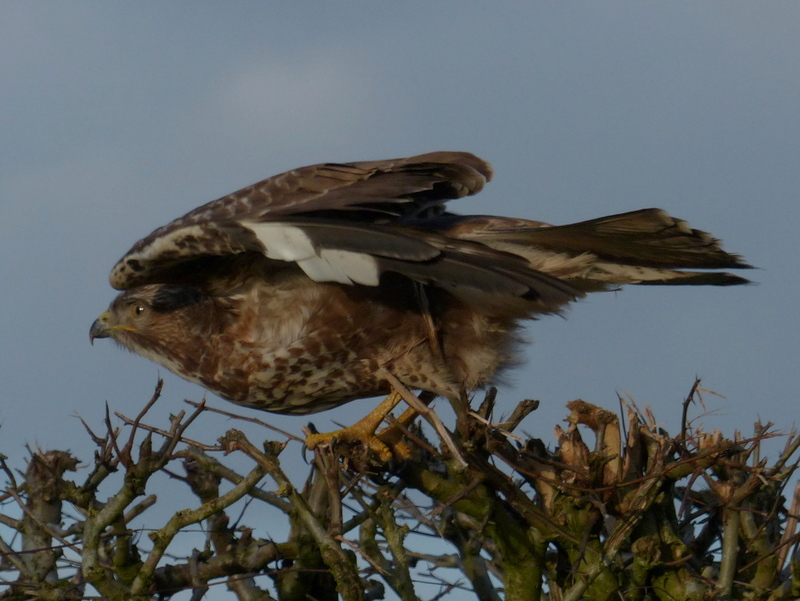 The buzzard photos are wonderful. I love hearing Buzzards too. 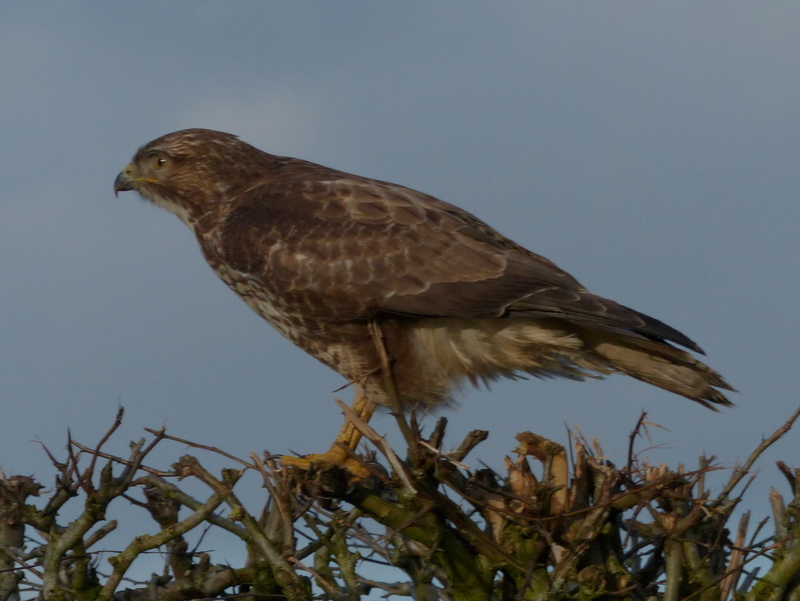 When we went to live in Somerset in 2004 I got to see Buzzards regularly for the first time ever. Coming back here again in 2006 I felt sad that I was leaving them behind but I am so pleased to find that they are starting to live here again and we hear and see them now and then. 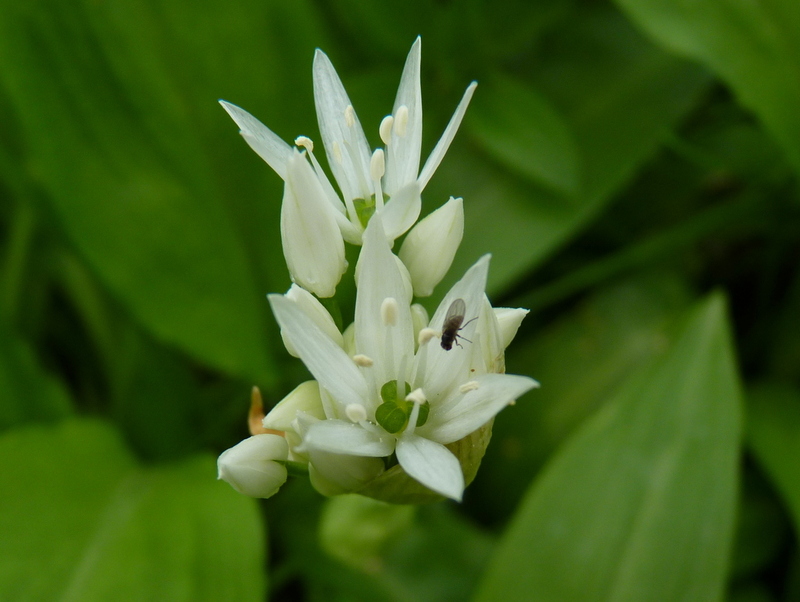 Thank you Clare 🙂 A single Ramsons bulb? Was it your birthday? 🙂 I hope that it takes, once established they spread easily but you may have to wait a bit for those delicious herby salads. Yes, just the one bulb! He got it when he was shopping with my daughter while she chose something as a gift for me on Mothering Sunday. I left it in its pot until it flowered and then planted it out. I will be very pleased if it has survived. What a lot of adventure for one day. You deserved your drink! Your raptor photos came out well despite your saying otherwise. 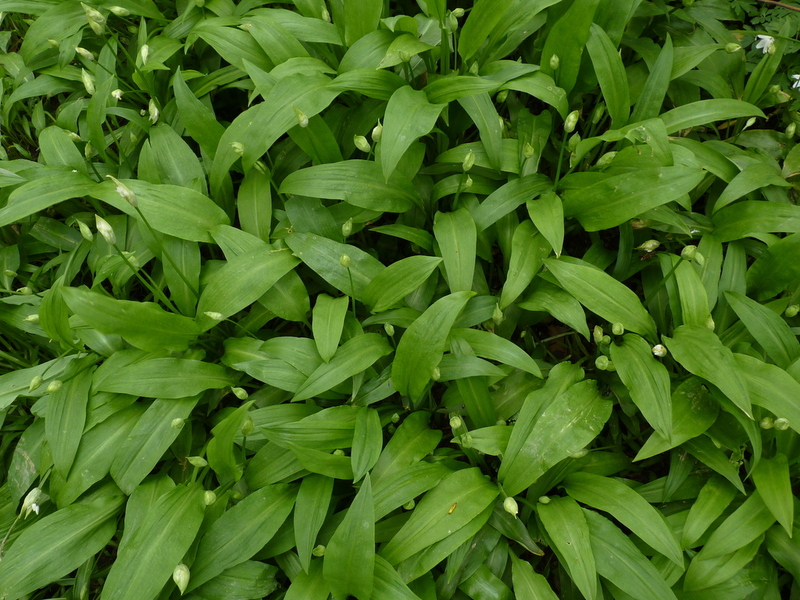 We have Allium tricoccum here in the US, called ramps, spring onion or wild garlic. They look very similar. Wild patches are coveted and no one shares the location of their ‘secret’ patch! Thanks Eliza 🙂 I have just been reading about your Ramps, they seem to be very popular in the US. 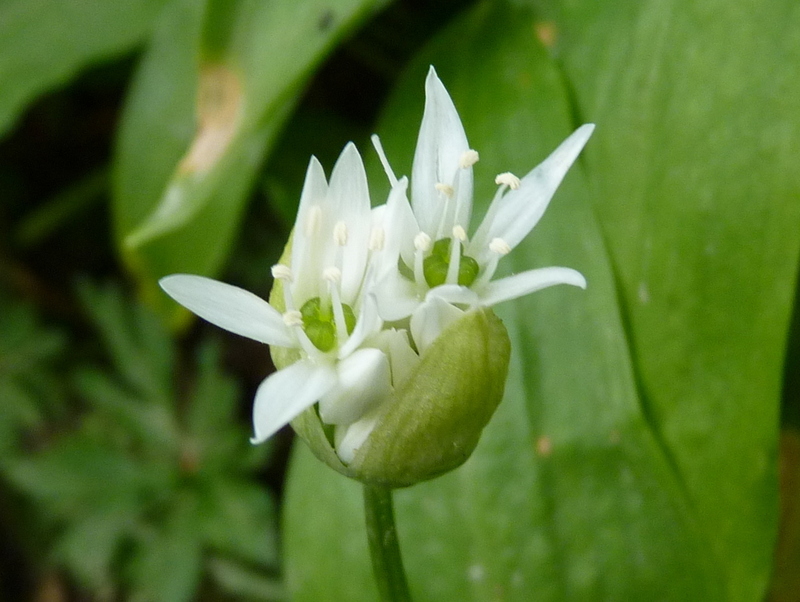 Whilst writing about our Wild Garlic I came across the information that it was considered invasive in the US and thought, well at least they can eat this one. How invasive can food be? Garlic mustard is just such an invasive edible. What a reproducer that one is – 10,000 seeds per plant. Do the math on that one over a few years and you have a very successful plant! 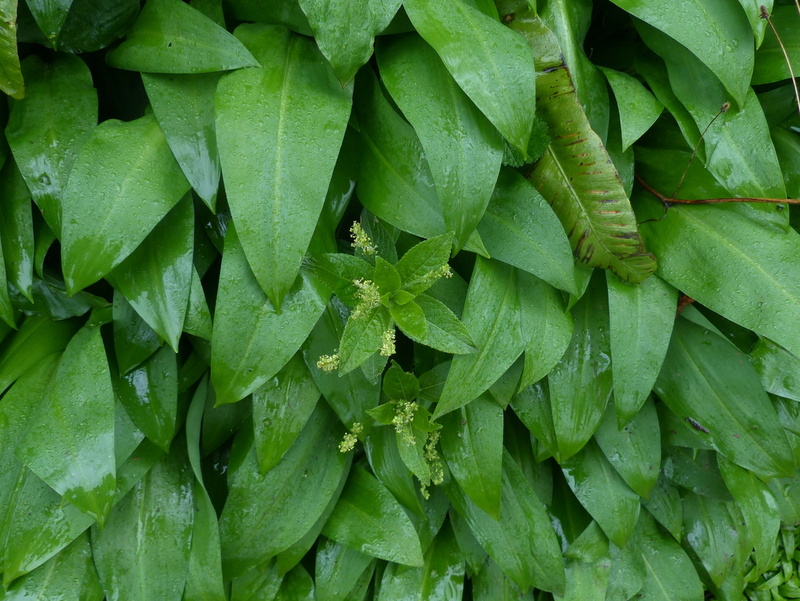 It is the first green to appear in spring and it is a bitter green, so it isn’t wildly popular, except in Asian dishes. Wow! 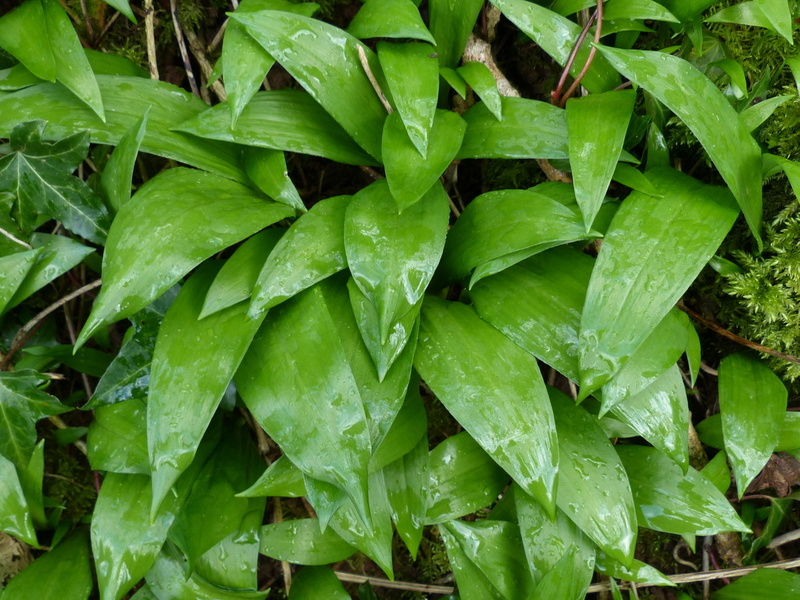 I’ve never seen wild garlic and it’s quite beautiful, let alone useful! I’m so glad you found the lost sheep and got your drink. Thank you Joey 🙂 It is beautiful, useful and smelly but in a nice way. Very fun post with super segue from adventure to garlic. 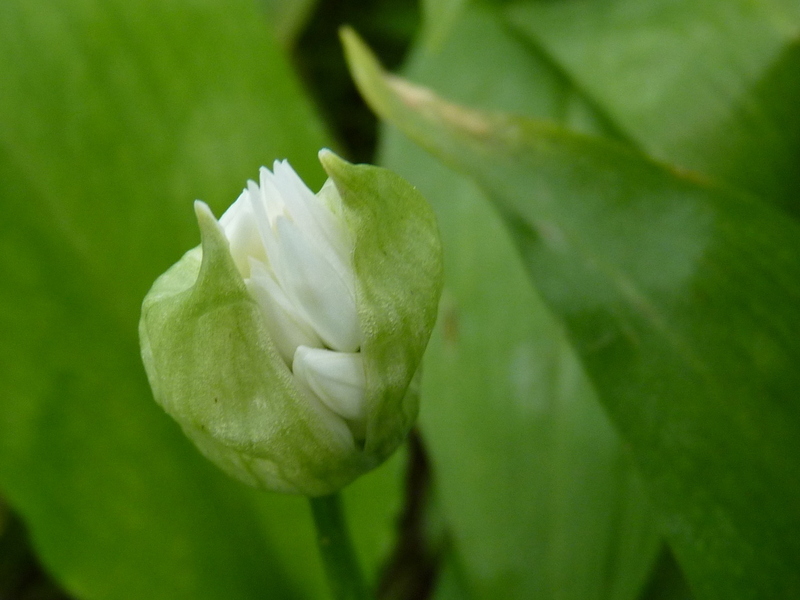 Superb photos of both the Buzzard and the Wild Garlic. How far away was it? The Buzzard I mean. (It can’t be easy photographing birds of prey in the wild. I have enough trouble in the Botanic Gardens and Zoo where the birds are used to humans). I’m glad you got your Whiskey too – winter nights are cold and a warming drink, or two, is not to be missed. Thank you Vicki 🙂 This bird was about fifteen feet away and it only allowed us to get so close because we were disguised as a truck. I am sure that it wouldn’t have allowed me to approach on foot. I would have loved an in flight shot but I was too deep inside the vehicle and my window of opportunity to narrow. I just couldn’t follow it as it took off. Next time. Very interesting and great photos (as usual). Thank you Andrew 🙂 They are colourful Sheep. Whenever anything happens to them they get a splash of paint to show that they have been done. So a splash of red on the head means this one was wormed in January and so on. It will all come out in the wash. The garlic is marvelic and the buzzard is beloved 🙂 Fizz is on a roll! Thunderbirds are Go! You’re coffee drink sounds sublime but methinks you need GPS or transponders for those sheep, if you are ever to get any sleep. 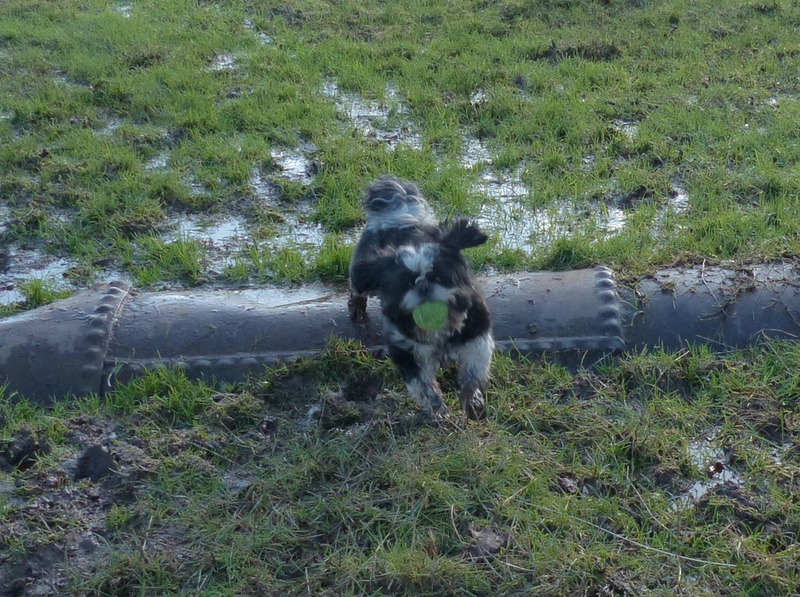 Thank you Stephanie 🙂 There was another stuck sheep yesterday and I thought that I cannot write about rescuing sheep again, it is all that we do now but in this weather there is not much else to do. Counting Sheep keeps me awake at night. I’ve said “stupid, stupid sheep” on many occasions in the past. Once we had a small mob living near the house that I had to count daily as I penned them up for the night due to dingo attacks. It was usually the evenings I had a great dinner planned and was looking forward to something special that one would go missing. Searching for hours would delay or cancel much anticipated proceedings! Yes, stupid, stupid sheep… 🙂 Sounds like you enjoyed the whiskey though. Great story. 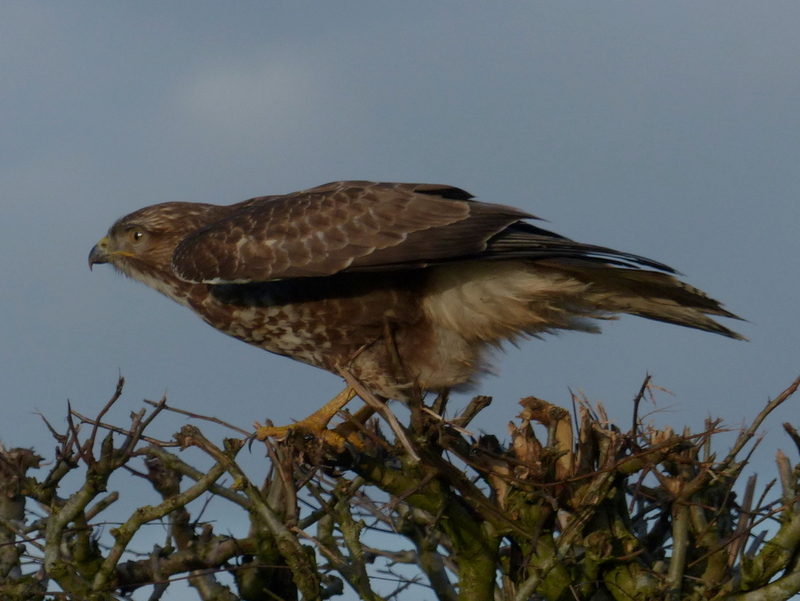 I enjoyed the picture of the buzzard and the garlic – I had never seen either this close up!! I was wondering if you liked my Troll post on Granny’s Garden ? It’s so cheerful to see flowers out at this time of year. 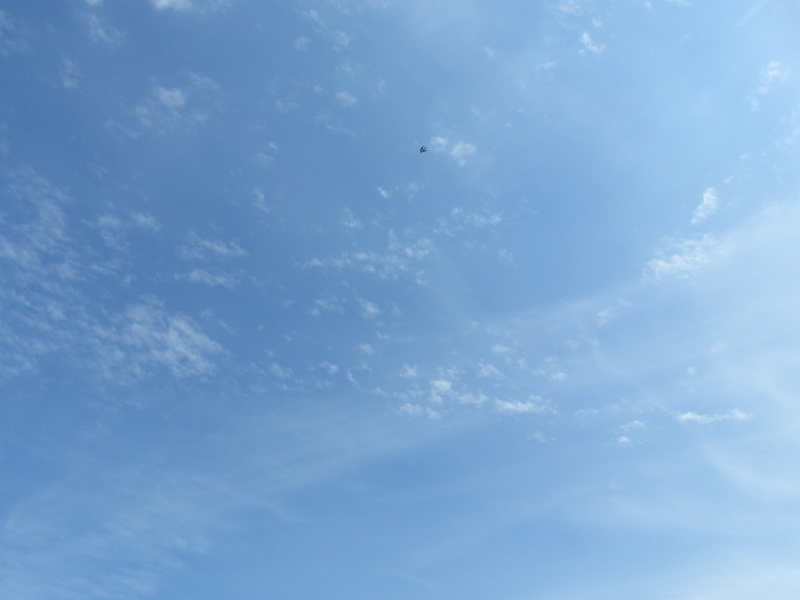 The buzzard photos are brilliant, the most I’ve ever managed to get is a speck in the air. Thank you Emily 🙂 I have tried and tried to catch them as they circle in the sky. Most of the time I can’t even find them with the camera and when I do and try to zoom in, I just can’t get focus quick enough. I think that is just the limitation of my camera. I was very pleased to get one down at my level. 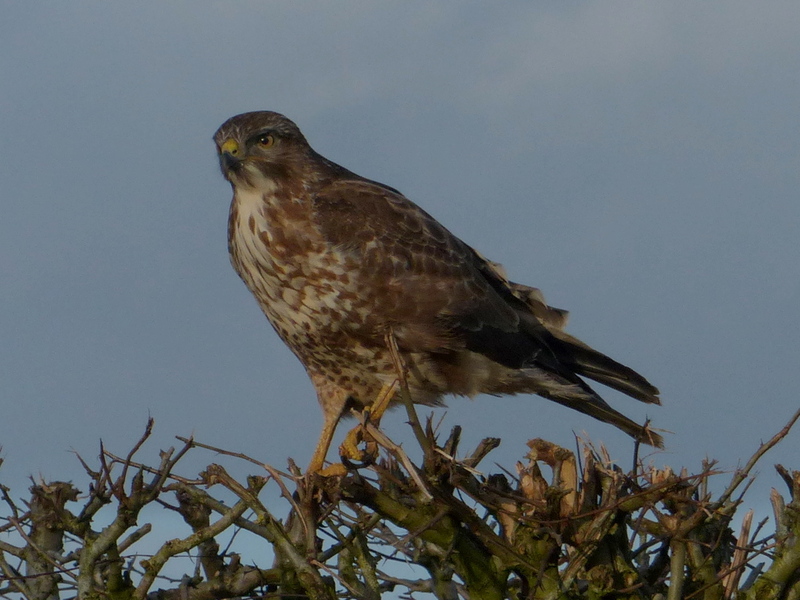 That buzzard looks more like a hawk to me, but I think you are probably more capable of identifying it than I. I also love to watch the buzzards that drift and circle in the sky above our town in the summer. 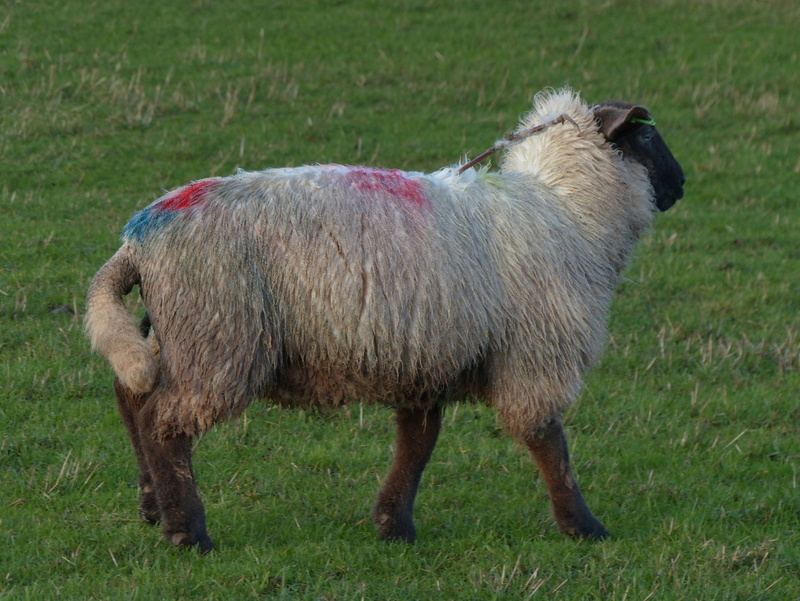 Years ago, while living on my in-law’s farm/ranch, we raised sheep–my husband and I, and I have to say we weren’t too smart about it… left a ewe tangled in a fence all night long (coyotes howling all night long), left one in a snowbank for 2 days her feet tangled up in baling twine (a neighbor spotted her), mistook a buck for a ewe and wondered why it never lambed… I know, I know. We didn’t do a whole lot better with chickens either. Thank you Joy 🙂 I am afraid that I know nothing about Sheep except how to count them. It is Monday morning, pouring with rain and there is a gale blowing. There is almost certainly one stupid sheep tangled up out there somewhere. 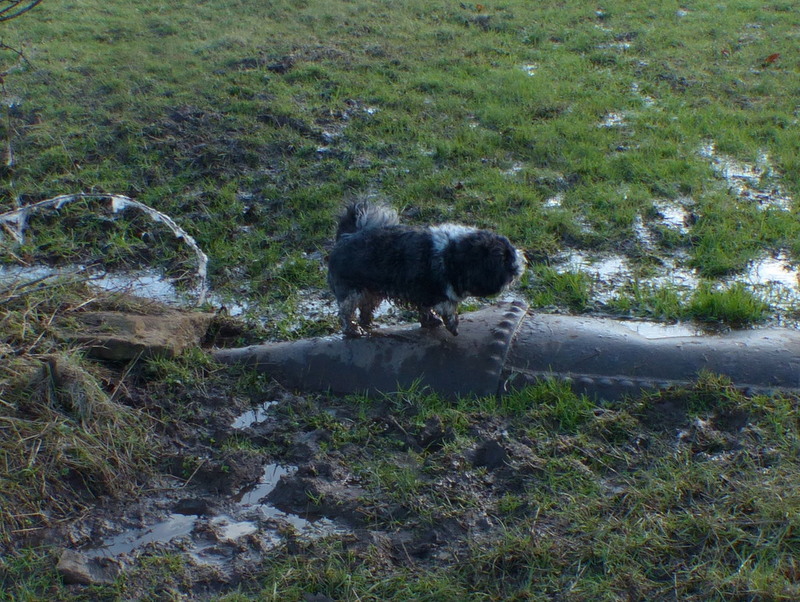 It’s a good job Fizz is tough. “Like Hopalong Cassidy doesn’t carry a gun.” Hahahaha. Great post. Not sure why I’ve not been getting notifications of your always interesting posts, like this one. I thought perhaps you were taking a break. I may have to unfollow and refollow. Dear Colin, Your post touched me in such a special way today. All your fuss over that one “stupid” sheep has reminded me how the Good Shepherd “fusses” over me…even when I am acting “stupid” which is more often than not. 🙂 “What do you think a man does who has one hundred sheep and one of them gets lost? He will leave the other ninety-nine grazing on the hillside and go look for the lost sheep.” (Matt 18:12) (Psalms 23 for a picture of the Good Shepherd) I can never stray too far without the Good Shepherd coming to my rescue. I was even thinking about God losing sleep over me, as you do with your sheep. Anyway, I really needed this today- thank you! 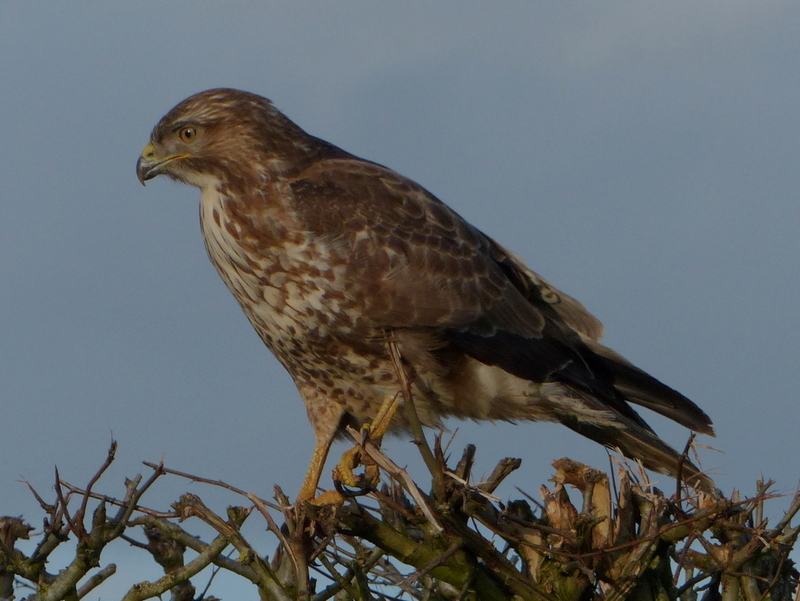 Also, I can’t get over how much better looking your buzzards are than ours. 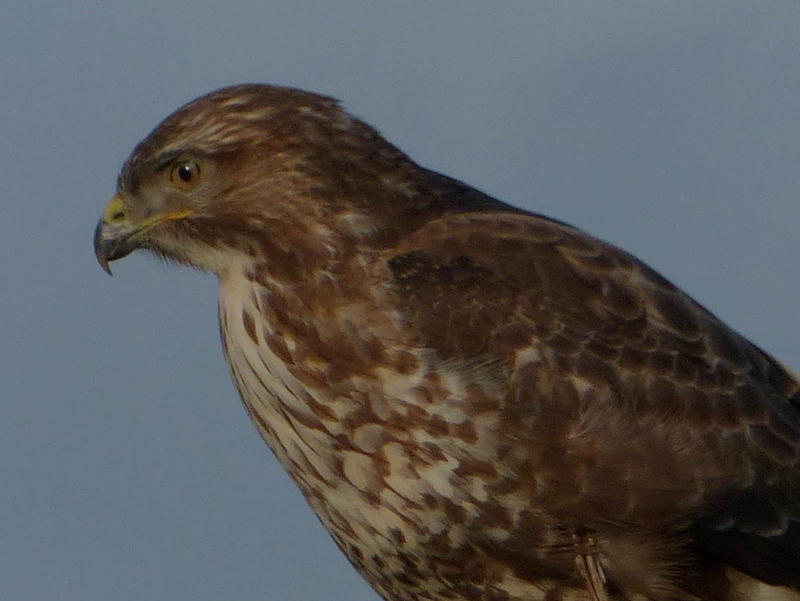 Here, we might call your buzzard a hawk. 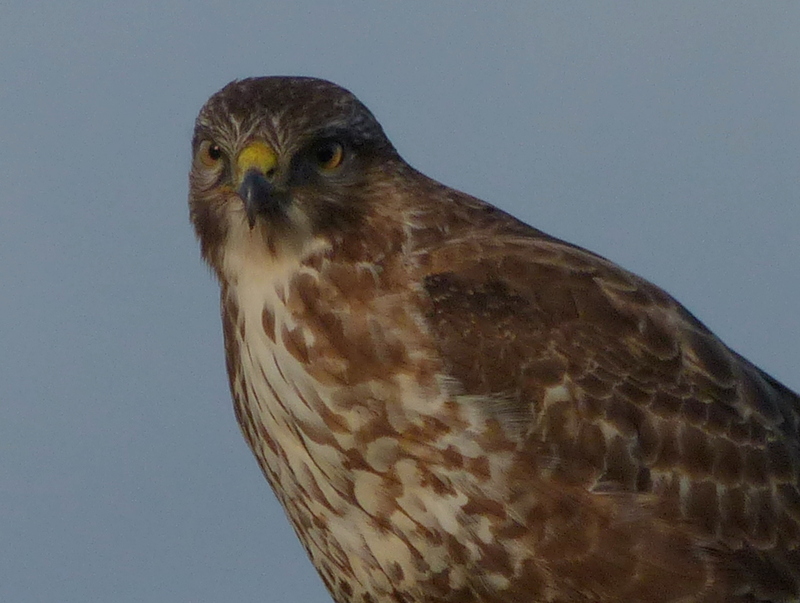 (and if you do call your hawks buzzards, then what do you call your hawks?…) Either way, your pictures are beautiful and make me realize how amateur I am with a camera. Wow! And who knew garlic could be so lovely?… Thank you for sharing your adventures! A wonderful article full of high adventure and low victory rolls. and great photography to boot. What more could a guy ask for? 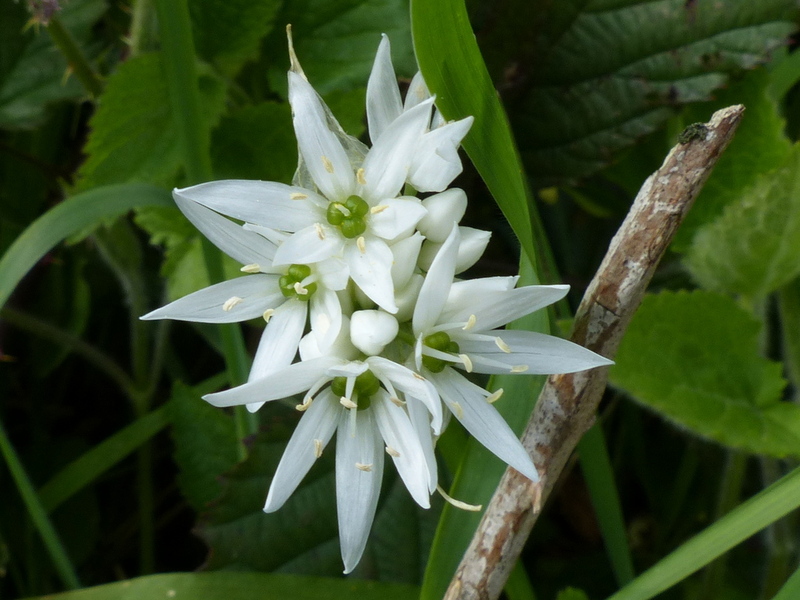 Very useful post – I often collect wild garlic. never really noticed anything in with it. 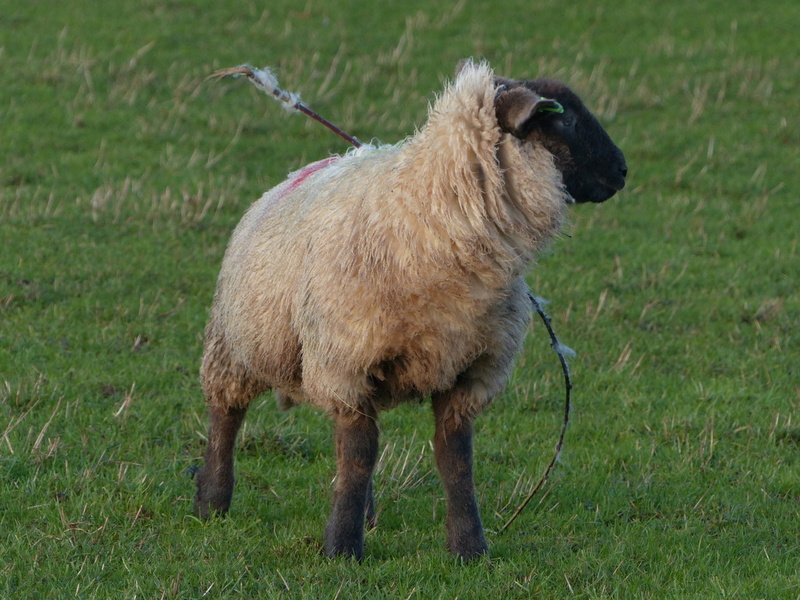 As for stupid sheep, haven’t they been bred that way? They often pile up and suffocate each other in the snow, but the old breeds esp from the north, are far more sensible, but with intelligence comes independent behaviour, which farmers don’t tend to like. Thank you Barb 🙂 I don’t think that the Sheep are particularly stupid but then I only have Fizz and myself to compare them to. Where I live we have “society garlic” which looks a lot like what you’re picturing, but in a lovely lavender. I wonder if I could eat them… I never even thought about it before. Thank you Sharon 🙂 Steamed like spinach sounds like it could work. I will give it a try. It’s great having friends who look after one another. Glad you found the sheep, and the buzzard, and enjoyed your whiskey and coffee. You earned it! Love the photos of the buzzards. You are so right about their wonderful call. It’s always nice to hear it when they are soaring around. Thank you John 🙂 Yes the call is fantastic and it is such a part of where I live now. We always hear them when we go out on walks and often just when I open my door. How beautiful the flowers are! 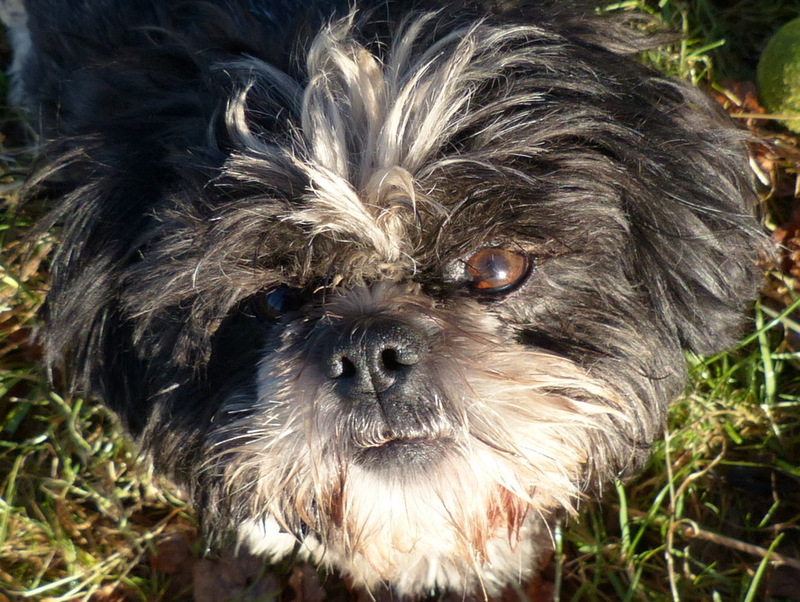 But Fizz you are more of a beauty love! This a wonderful story. Nice to see you give the botanical name. Thank you Betty Louise 🙂 Well things have so many different common names. 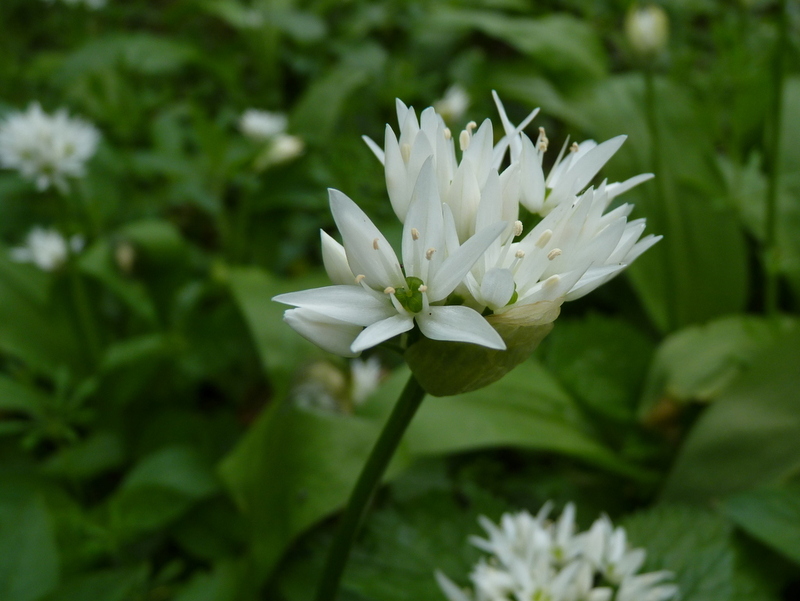 Wild Garlic is one of my favourite flowers. Ai first Xi didn’t recognize theflower. Our garlic is a little different. Loved the buzzard. Wonderful birds!